I used to drink a fair amount of Sumatran coffee, before I started branching out to explore other flavors and lighter roasts. I haven’t had a cup of Sumatra in at least a year (probably longer), so I thought it might be nice to revisit it with a new roaster. Red Bird Coffee, based in Bozeman, Montana, is a small batch roaster that seems to be best known in coffee forums for its Red Bird Espresso blend, which reportedly tastes like Snickers bars. I ordered a pound of the espresso blend at the same time as this Sumatra Permata Gayo, and I can confirm that the USPS Priority Mail box definitely smelled like Snickers!! Heavy on the peanut and chocolate/caramel aromas. First impressions: The Sumatra whole beans didn’t really smell like chocolate, but they had depth to them. Red Bird classifies this as a “Rich Medium” roast. “Medium” doesn’t really signify anything, as different roasters will define it different ways, but these beans are a bit darker than what I’m used to seeing vs. other “medium” roasts. The coffee was roasted long enough that oils were starting to come to the surface. The aroma strongly reminded me of the Sumatra from Peet’s Coffee, which also tends to be roasted darker than what is typical nowadays amongst craft roasters. 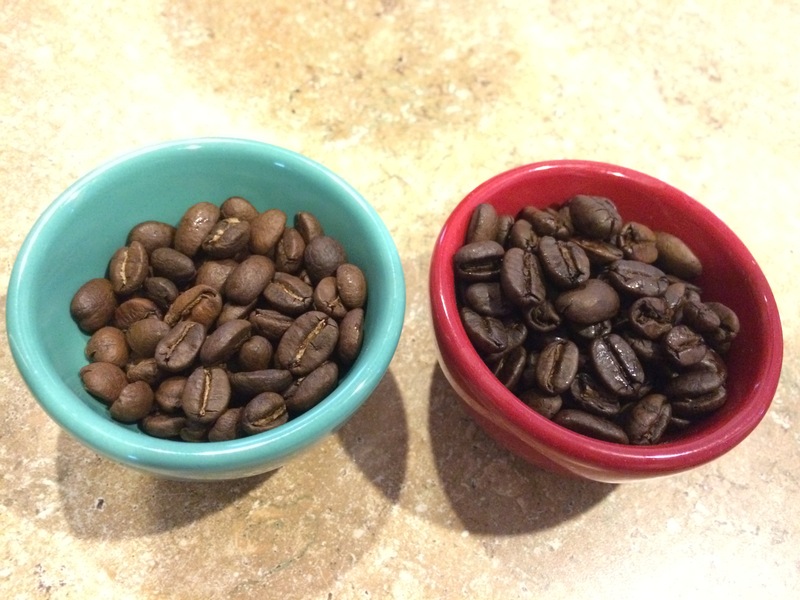 A “medium” bean on the left*; Red Bird’s “rich medium” on the right. French press: Dark but mild flavor. No fruit or flowers. Nutty taste, but in contrast to the Coffee del Rey Mexican Chiapas beans I had recently, no chocolate flavor… tastes more earthy but thankfully not gamey/off-putting. Chemex: Thinner in texture but otherwise has the same flavor notes as the French press cup. This coffee is sort of moody and brooding. Is it going too far to call this “Eeyore in a cup”? AeroPress: This method brought out a little spice in the finish – livened up the cup a small bit with toasty flavors. V60: Tasted kind of plasticky right off the bat but it smoothed out and I tasted toasted almonds along with the earthiness. Summary: I think this coffee is great for dark roast fans, who want to try something a bit lighter than what they are used to if they usually drink stuff like French Roast. Sumatran coffee has a reputation for being kind of funky, but I didn’t find that with these beans – they definitely had an earthiness to them but they didn’t taste or smell weird or anything. From the roaster: This coffee has a smooth deep body, a cleaner taste than most Sumatras, with mild spice, remarkable sweetness and a hint of almond and berries in the finish. You b doin’ a great job writin’ I enjoy your articles!